I discovered this death certificate by searching on the surname “McEntire” at FamilySearch (see my post about “Finding GA Death Certificates from 1928 to 1930“). I immediately recognized the parents’ name and a quick look in my database confirmed my suspicion that I did not know about this daughter. Since Laura is a new person, almost every bit of data on this death certificate1 is new to me. 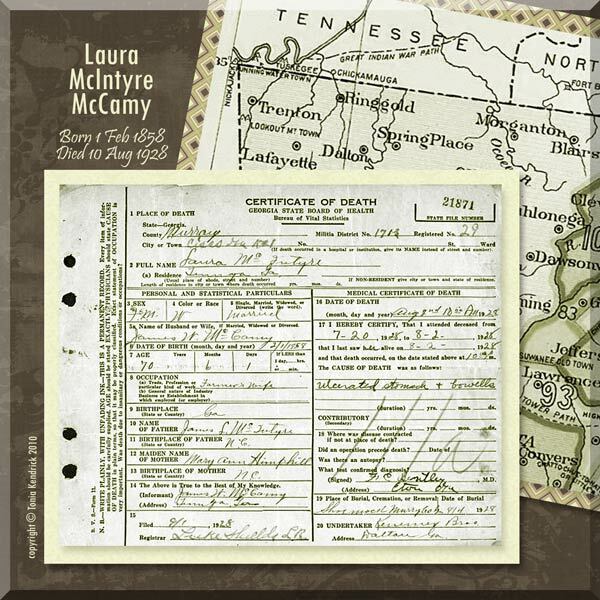 Name: Laura McIntyre [one usually sees this surname spelled “McEntire” in Murray County]. Look for James L. McIntyre on 1860 census to confirm that Laura is in the household. Check Georgia marriage records for Laura and her husband. Win 2 Tickets to the Atlanta Family History Expo! 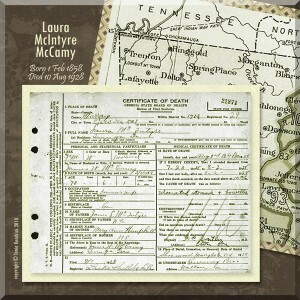 Your death certificate image project is really interesting! You didn’t do that on Ancestry’s site, did you? Really nice. I wouldn’t mind a future blog on how to make a scrapbook image like that! Beautiful. Thanks Debra! I’m really pleased with how this one turned out. I think I did it in Photoshop Elements. Sometimes I use Picasa and sometimes I even use both, depending on what I want to do. I never thought about doing a post, but that’s a good idea. In the meantime, let me point you to BeNotForgot. She does absolutely beautiful collages and inspires me all the time. She has some tutorials on making collages with Picasa (this is actually where I learned how to use Picasa).